For a long time now, talk has been on proof of work consensus algorithms and their modus operandi. On one hand, the transaction confirmation protocol has been around since early 1990s only getting traction from early 2000s after Bitcoin roll out. Read: Bitcoin maximalists reveal Proof of Keys failures but is it all just FUD? On the other, the system is a hallmark of decentralization but gobbles up power because of the energy demanding mathematics. As we know power is not cheap and this has been a cause of debate for the better part of Q3 and 4 of 2018. 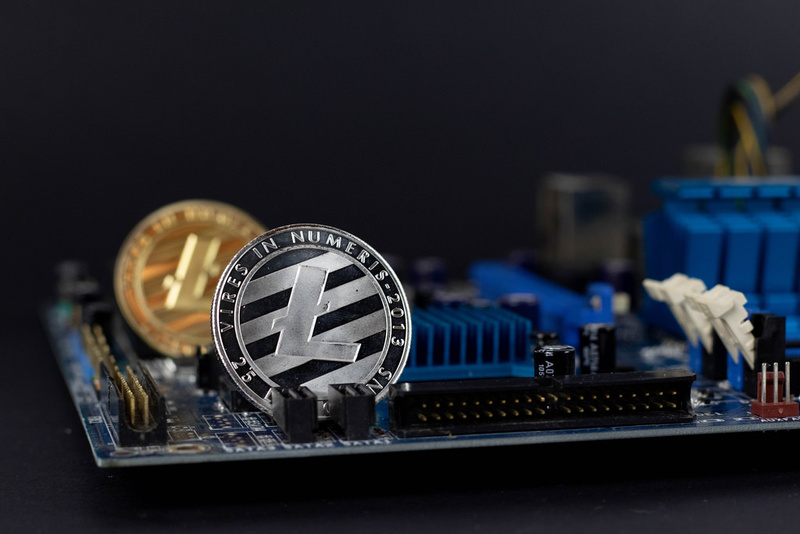 Litecoin is one of the many altcoins powered by proof of work algos but the rise of the so called “efficient and scalable” alternatives using proof of stake or even dPoS has led to questions on the long term viability of this decade old system. It was even made worse by Ethereum Classic hack and although Charlie Lee was the one who defended the platform saying decentralization leads to susceptibility and as long as decentralization exists then at one point, a network must be prepared to bolster its security against a double spending attack. It’s a race for computational power. Depending on how cheap it is to rent hash power from sites as Nice Hash, then double spending attack can come in fast, devastating projects. For example, to successfully double spend in the Litecoin network, Crypto51 theorizes that it will cost $21,461 an hour which is expensive but affordable for determined groups or organizations. Meanwhile, Litecoin like the rest of the market is melting. At spot prices, LTC is down 5.5 percent against the green back but encouragingly up three percent in the last week and still perched at eighth. From the candlestick arrangement, stops of our previous long positions have been hit and it appears as if sellers are snapping back to action, unwinding gains of early Jan 2019. Still, we retain a bullish outlook only shifting projections if prices drop below Nov 2018 lows of $30 at the back of above average volumes. From a top down approach, the path of least resistance is crystal. Sellers are in control trading within a bear breakout pattern. While this is negative, the trend can easily shift if bulls build enough momentum and break above our short term targets at $50 at the back of above average volumes. That will not only resuscitate market confidence but will be a foundation from where prices can rally to $150 and even $200 by end of Q1 2019. Aside from price patterns, note that yesterday’s sell off printed at the 50 percent Fibonacci retracement level of Nov—Dec 2018 price swings. Although there is confidence and general expectation for higher highs, bull volumes are thin. In the last two months for example, we haven’t seen bull candlesticks printing at the back of high volumes exceeding recent bear volume highs. Yesterday’s volumes were higher than recent averages—449k versus 260k and better off than recent volumes behind higher highs complementing the drives behind the ecstatic bear bar of Nov 20—751k versus 259k. Since this spike in market participation coincided with the 50 percent Fibonacci retracement level as aforementioned, LTC bears may flow back confirming yesterday’s retest and ushering in the next phase—the trend continuation phase of a typical bear breakout pattern of mid-Nov 2018. That’s when prices broke below $50. Because of these technical factors, traders are better off converting their holdings to stables until after volatility taper. 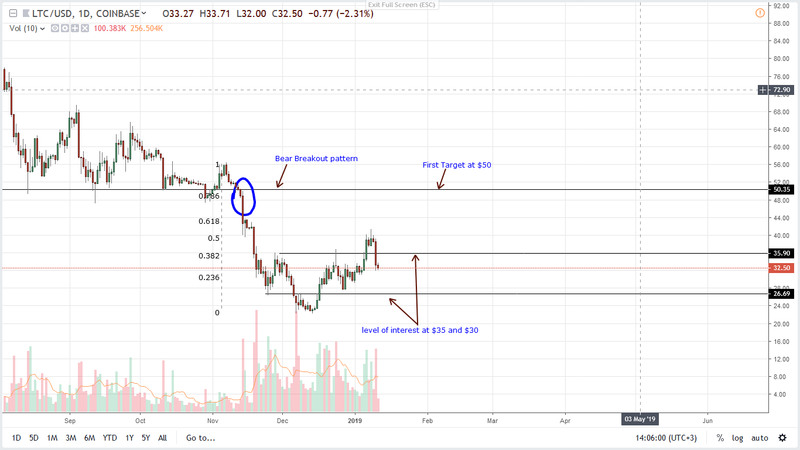 Probable supports are at $30 but as above, drops below $30 could see LTC melting towards 2018 lows of $20. Previous ArticleHow To Sell or Trade NEO Coin?